How cool is this? 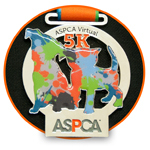 In June, the ASPCA is hosting its first Virtual 5K. I know, I know. We're not the 5K type, but this one is important to our neighbors at the ASPCA who do important work to raise awareness and much needed funding to support their programs. Your donation will help provide life-saving care and services to millions of animals nationwide. We're thrilled to support a staple in the community as they fight to give abused and homeless animals a second chance at life. While I love seeing my cat friends in the window on E. 92nd Street, I know they'd much rather find a family to belong to.